Gaye was appointed Clerk to the Company in October 2008. She was born in India on 21 August 1954, daughter of a tea planter. Educated at Tormead School, Guildford, and Wispers School, Haslemere, she did not really have any clear idea what she wanted to do after school so her anxious father enrolled her in secretarial college so she could earn a living. After working for a number of years in various legal firms she gave up work on the birth of her first son. Her career in the livery began when she started to look for a part-time job. A close friend was secretary to the Master of the Solicitors’ Company whose elderly Clerk was looking for assistance a couple of days a week. When her youngest son started full-time school Gaye decided to look for a Clerkship in her own right and was appointed Clerk to the Marketors’ Company (of which she is an Honorary Liveryman) where she served for 12 years before her appointment as Clerk to the World Traders. 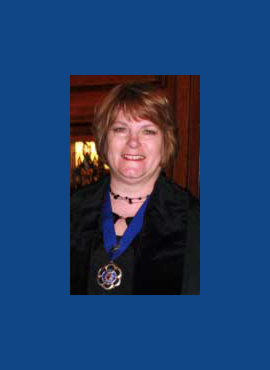 She is a member of the Fellowship of Clerks, of which she was President in 2003-04, and is a former member of the Livery Committee. Gaye has three sons and lives in St Albans.